(flan'-el-mouthd) adj. 1: speaking indistinctly. 2: speaking in a tricky or ingratiating way. The Ember Update: Party, Maze, Aurora, etc. GinohnNews: Librafest for Us and Treedom for All! I'm back from a week in Europe and it was a fabulous trip! I'm gonna start by describing the Essen game fair, which was my official reason for the trip; scroll down if you want to get right to my observations about Amsterdam, the Atomium, or Recycling Bins in Europe. But the real fun came at the Essen Spiel, the German game convention which is like a cross between Toy Fair and Origins and is the biggest (at least in terms of attendance numbers) game-related trade show in the world. 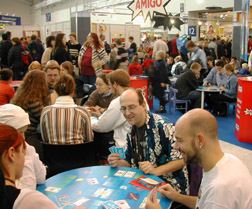 I was there to help promote the new German edition of Fluxx, which has been published by the German game company that sounds like a Spanish game company, Amigo. At first, it was all I could do to play with the Germans and try to follow along as they talked. I'd let an official Demo Crew person explain the rules, then I'd get in on the game. I liked trying to be incognito, speaking rarely and trying to act like my vaguely-confused expression had to do with trying to figure out the game, rather than not understanding what everyone was saying. But the Demo Crew guys kept telling the people that I was the game designer, and then they gave me a badge with my name and the word "autor" so I had to start introducing myself, saying "Ich bin der Amerikanischer inventor von dieser Spiel, und mein Deutsch is nicht so gut, aber ich verstehe dieser Spiel sehr gut." (I'm the American inventor of this game, and my German is not very good, but I understand this game very well.) And of course, I do... even in German, I can play Fluxx without hardly thinking about it. I was still reluctant to actually try teaching people to play the game, and I passed that buck whenever I could... but by the end of my time there, I was even explaining how to get started to Germans, auf Deutsch (my own version of it anyway) without any help from anyone. 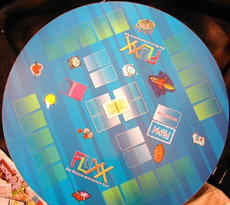 For me, the greatest moment of the trip was the time when I was actually playing Fluxx with 2 different groups of Germans at the same time, hopping back and forth between my chairs at two side-by-side tables, having taught both groups of Germans to play, in German, on my own. Frau Bensen would have been so proud of me! My traveling companion throughout this trip was this guy shown here, named Russell. Because of all the other events we're doing, we decided Looney Labs could only afford to send me on this particular trip; but Kory and Russell decided they wanted to come along on their own dime, so I was nonetheless in the company of friends. Kory was joined by another friend of his, named Jeff, and they spent extra time before and after Essen visiting other parts of Germany; but Russell and I chose to visit other countries during the beginning and ending phases of our Essen trip, visiting Amsterdam beforehand, and going to see the Atomium in Brussels afterwards. Needless to say, visiting Amsterdam again was a very cool experience. 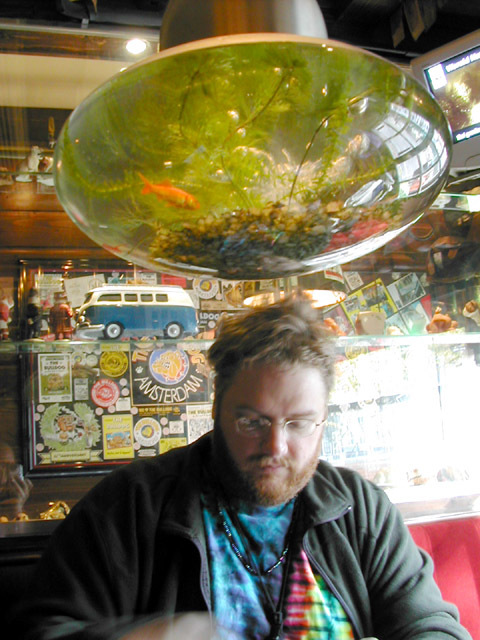 This was also Russell's second visit to Holland, and we both really enjoyed getting to smoke marijuana again in their wonderful public coffeeshops. We had an absolutely grand time going from one coffeeshop to another, sampling their wares, enjoying their ambiance, and playing a game or two, then moving on to the next groovy hangout for more of the same. In our short stay there, we managed to visit 19 of Amsterdam's finest coffeeshops, and we left with the feeling of having just gotten started. 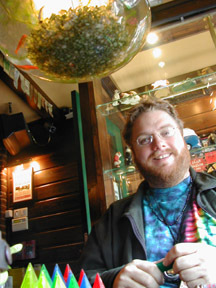 To a marijuana legalization advocate, there is no experience more invigorating than a visit to the Coffeeshops of Amsterdam. It's truly an amazing place to be. It's like a trip to the Future: to a time when America wakes up (again) from the nightmare of prohibition, and allows free enterprise to do its thing. I believe that if mainstream America could really see and understand how well the coffeeshop system is working in Amsterdam, the drug peace movement would be making much faster progress. If you've never been there, I encourage you to go see if for yourself. For some people, the ideal vacation is a week at the beach. For others, it might be the mountains, or maybe at one of those big resorts in Florida. Perhaps it's Vegas. 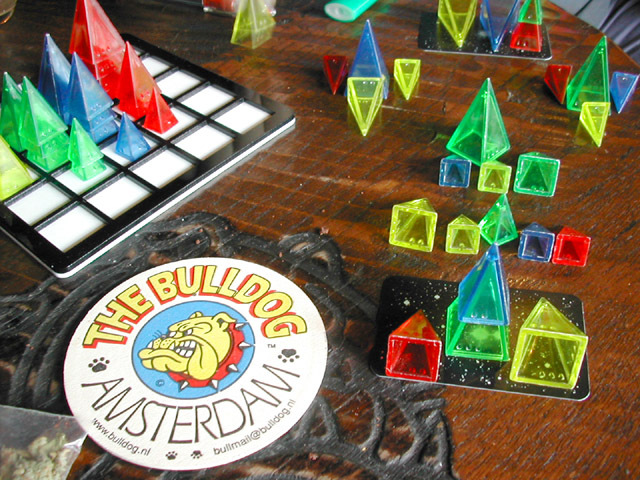 For me, nothing beats a few days in Amsterdam, playing as many games as possible in as many coffeeshops as possible. Also, many folks build a tradition around vacationing in the same place every year. I've never been able to relate to that -- until now. But I can't wait to go back... I'd like to make this an annual tradition. One of my favorite things about World's Fairs is the fabulous futuristic buildings they sometimes leave behind. Seattle's Space Needle, New York's Unisphere, the Sunsphere in Knoxville, even the Eiffel Tower in Paris... these structures are all relics from World's Fairs past. 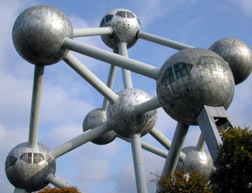 Another is this one, known as the Atomium, built for the 1958 Expo in Brussels. I've always wanted to see it, so after leaving Essen, Russell and I took the train over to Belgium to check it out. And it's really cool! You can still take the elevator to the top for spectacular views, and there are new exhibits and displays to see in the various nodes, which you travel between via stairways and escalators. Our visit was so perfect that the generally cloudy weather cleared off for a little while, allowing me to take this gorgeous photo. 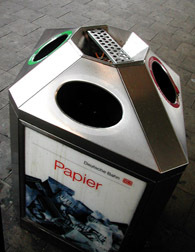 Lastly, a few words about trash cans in Europe. They're way ahead of us over there, not just in terms of drug laws, but also in providing well integrated recycling options. I was amazed when I bought a plastic bottle of cola in Germany and was informed I'd get a refund if I brought back the empty! 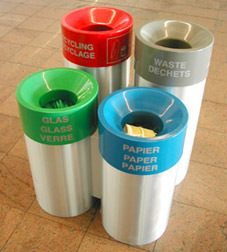 Moreover, I was delighted to see that the convention center in Essen featured these wonderful compartmentalized trash & recycling bins, giving me hope for the idea that someday, the convention centers here will become similarly responsible, thus eliminating the need for Becca's recycling efforts. 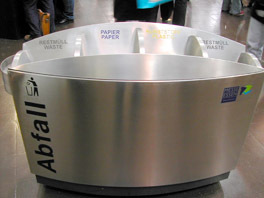 And it's not just at the convention center, either... check out these other compartmentalized waste bins I saw, in the train station at Essen (on the right), and at the airport in Belgium (on the left). What must we do to get services like these here in America? We ate dinner one night at a Chinese Restaurant in Germany who had English language menus for us, which had obviously been translated from the German version of the menu, with humorous results: Chicken Breast became Chicken Chest, Wan-Tan soup was described as "paste bags with meat", plus the menu included Sea-tongue (whatever that might be) and the wonderfully named "8 Preciousnesses." Russell and I played a lot of games during our trip to Europe, but mostly we played Homeworlds. (I estimate we played it about 20 times.) I like it best as a 2-player game, but with one little rules modification: you should limit the number of pieces available of each size to 3 instead of 5. Also, a Volcano board makes an excellent storage/organization tray for the bank of unplayed pieces.